New Zealand's capital city of Wellington, on the North Island, is easy to reach by air from major international and regional airports in New Zealand, Australia and many other locations around the world. 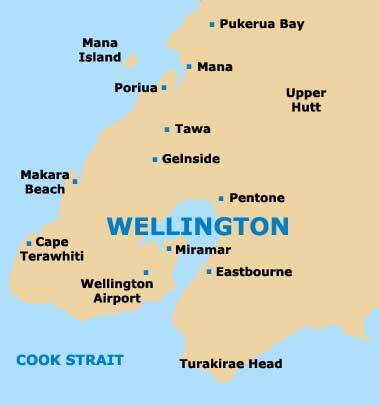 Wellington Airport (WLG) features direct flights from all over New Zealand, including Auckland, Blenheim, Chatham Islands, Christchurch, Dunedin, Gisborne, Hamilton, Napier, Nelson, New Plymouth, Picton, Wanganui and Westport. 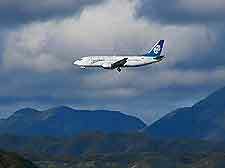 Located near to Wellington city centre, Wellington Airport (WLG) has good public travel and transport options and car hire is readily available at the airport. 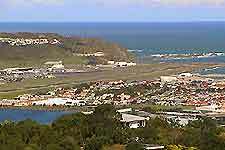 Wellington Airport (WLG) can be found just 8 km / 5 miles to the south-east of central Wellington. The airport is one of New Zealand's largest and most popular airports, with a huge number of regular and scheduled flights. Wellington Airport (WLG) has one large airport terminal, with good facilities. The terminal at Wellington Airport (WLG) serves a number of national and international airlines at the airport, including Air New Zealand, Qantas Airways, Freedom Air and Soundsair, all offering a variety of different flights, including many budget options. Central Wellington is extremely easy to reach from Wellington Airport (WLG), with the main route being through the tunnel around Evans Bay and close to Mount Victoria. The journey from Wellington Airport (WLG) into the city centre takes up to 20 minutes, depending upon traffic levels. Buses travel outside of Wellington Airport (WLG) at regular intervals and are operated by Stagecoach Flyer. Travelling between Hutt Valley and Wellington city centre, these airport buses are located to the south of the airport's terminal building. Airport bus travel into Wellington is the most inexpensive way to travel. Shared shuttle buses are becoming an increasingly popular method of transport at Wellington Airport (WLG) and this much-used minibus service links the airport with any address in the city centre. Regular shuttle buses at Wellington Airport (WLG) depart from the airport's terminal building entrance and the cost is generally dependent upon the number of passengers travelling on the airport's shuttle bus. Many airport taxis are situated outside of Wellington Airport (WLG) and the airport taxi ranks can be found next to the airport's main terminal entrance. These airport taxis are extremely popular and provide and inexpensive way to travel into the nearby city of Wellington and other areas on the south coast of New Zealand's North Island. The journey into Wellington city by taxi should take around 15 to 20 minutes.